Launched in 2014, Lucy Green Designs creates beautifully flawless British Homewares. Lucy's hand-carved stamps and water colour paintings combine to create her unique style. Each stamp starts as a simple sketch, which is reproduced onto lino from which Lucy then carves her stamps. Using nature's colour palette contrasting against the pure white of the fine bone china, Lucy's products feature an array of country animals and farm life, inspired by her love of the farm and farmhouse kitchen where she grew up in the Dorset countryside. All eye-catching designs complement each other, but also have a impact on their own and look great in any country kitchen and on any country table. Lucy Green Designs strive to ensure that all their products are not only designed in Britain but also decorated and finished here too, adding to the authenticity of the products. Based in Dorset ourselves, The Country Catalogue has a close relationship with Lucy Green Designs and we get excited when they bring our new ranges! We think her style is extremely unique and the designed in Dorset element to their products is a brilliant way to promote British products. We stock the full range of Lucy Green Designs products which includes dinner plates, side plates, cereal bowls and mugs from their Farm Life range and Country Sporting range. Farm Life linen has been a huge hit, when bought together, they make a great country gift for anyone who loves being in the kitchen! Every cook or baker needs an apron, Lucy Green Designs - Farm Life Cotton Apron is perfect for protecting your clothes whilst looking good. The Farm Life Apron features the Farm Life printed pattern of Cows, Sheep, Chicken and Pigs which will brighten up any kitchen. Thoughtful details and finishing touches such as adjustable apron straps and contrasting colours and fabrics complete the apron. This apron is made of 100% cotton so you can be sure it is made of high quality material. 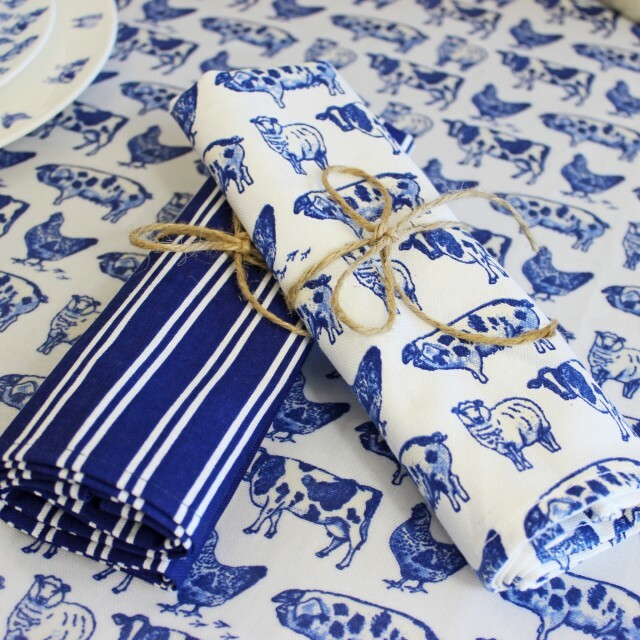 Why not purchase the Lucy Green Designs Farm Life Tea Towel to match? Includes a large hanging loop for easy storage and displaying in the kitchen. Lucy Green Designs products are not only ideal for those who love being in the kitchen, but for Farmers, Country/Shooting Enthusiasts and Dog Lovers. This is one of the many beauties of Lucy Green Designs, their Homewares can inspire you to buy a gift for many different types of people, particularly those who can be tricky to buy for! You're sure to be safe buying Farmers Gifts from the Farm Life range, you cannot go wrong with a Lucy Green Designs - Tractor Mug, Lucy Green Designs - Farm Animals 10.5" Plate or a Lucy Green Designs - Cotton Napkins (Pack Of Four). For Shooting Enthusiasts, Lucy Green Designs - Country Sporting Range is the way forward. Featuring Spaniels, Ducks, Pheasants, Cartridges and Partridge themed Homewares, you're bound to find something for everyone. Lucy Green Designs - Game Bird Mug is very popular as it features an array of stunning green game birds, the perfect gift for any keen shot. Lucy Green Designs mugs have a capacity of 425ml and are 8.6cm high. All of the fine bone china in the range is dishwasher and microwave safe. For those who love or own a Spaniel, Lucy Green Designs - Spaniel Mug is the ideal present. The mug features a green Springer Spaniel on each side, with a single small Spaniel and tracks inside. Alternatively, you might want to look at Lucy Green Designs - Game Birds Cereal Bowl, perfect for any country home or shooting lodge, this fine bone china cereal features an attractive array of painted green game birds around the rim. Why not kit out your shoot room with the complete range of Lucy Green Designs China? The Country Sporting range is ideal as you are covered from the cups of tea and coffee with the Country Sporting Mugs, to the dinner plates and bowls for the hot meal you may serve on the day. Exciting new additions for 2015/2016 are Lucy Green Designs egg cups and jugs. Both available in Farm Life and Pheasant addition whilst stocks last.